The Petal Passion Memories & More Card Pack holds a generous amount of beautiful cards - so I decided it was time to use some more of them! This one is coloured with Stampin' Blends alcohol markers and then trimmed with one of the Lots of Labels Framelits. I cut one of the little Enamel Shapes stars in half to better fit the centre of the flower. I trimmed a little scrap of Whisper White cardstock with another of the Lots of Labels dies, edged it with Pink Pirouette ink and stamped the greeting from the Bunch of Blossoms stamp set in Rose Red ink. The base card is Pink Pirouette and there's a layer of Rose Red cardstock embossed with the Simple Stripes Embossing Folder. 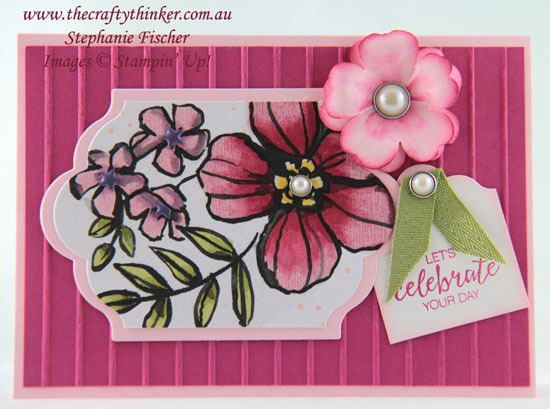 The flower is made from two layers of Pink Pirouette card cut with the Pansy Punch, shaped a little with a ball tool and lightly sponged with Rose Red ink. The finishing touches are the Metal Rimmed Pearls, Enamel Shapes and the little piece of Old Olive ribbon.